Yesterday I laid out what we communicate to others when we are late. Today I’m encouraging you to take steps to manage life like a boss. Maybe even like your boss. Unless your boss is this guy. Pick a calendar that works for you. Everyone has a smartphone now. 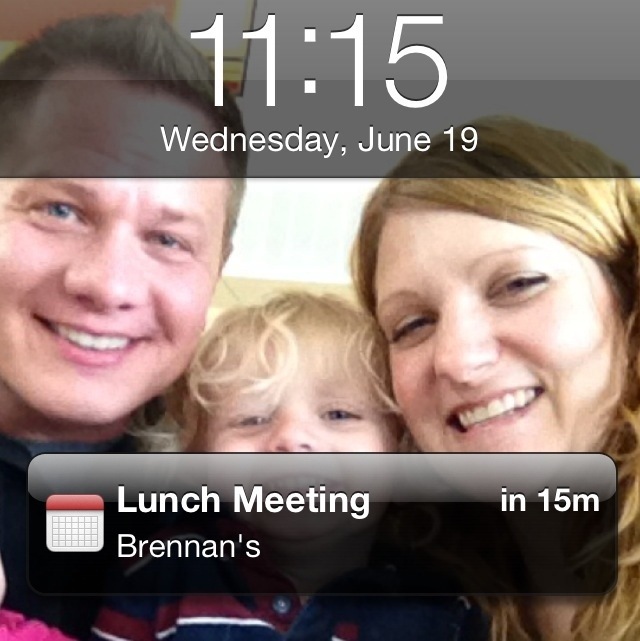 My iPhone has a calendar function in the base software that can sync to multiple different calendars and devices. I generally keep a personal calendar and then a professional calendar in outlook on a computer. This helps me not only to see where my family life and professional world come into potential conflicts, but also lets me shut down the professional stuff when I’m “Out of the Office” sometimes. There are a lot of calendar programs and services. They pretty much all sync and you need to settle on one. Mine are the iPhone and Outlook, synced together. And, if somehow you’re stuck rocking a vintage flip phone, it is time to hit up Barnes and Noble and buy a decent calendar that you can carry with you everywhere. Schedule Being Early. Here’s one of the biggest revelations in life. Being on time is the same as being late. You have to be early to really be on time. I mean it. I’m not kidding. This is the biggest concept you’ll need to embrace. I can hear the sound of your brain exploding. But it is true. Being “on time” is not for you. Early is how it works. Context provides just how early, but it is true. Here, I’ll prove it. When you get to church and it starts at 9:15, did you notice how everyone was in place early and the music started before you actually walked to your seat with that skinny latte you weren’t supposed to bring in with you? When you’re at an NFL game, when you sat down in your seats, did you notice that the players were already suited up, warmed up, and had a bunch of plays ready to go? Schedule being early in life like a major player; you don’t have to be a spectator. When in doubt: always plan to arrive, get situated, and be ready to operate at 100% no later than 15 minutes early. So if it takes you 20 minutes to park, grab gear, and get in position, then you add that 20 to the early 15. You arrive 35 minutes early. Try this all week and watch what happens. Have a good short range plan. On Mondays, since you’re now ready early, you can look ahead at the entire week. Get the biggest stuff on your radar. If there are open blocks of time on your calendar, determine if you’re able to leave them open, or turn them into “Busy” blocks that you can utilize to let the phone ring and get your top priorities accomplished. So, on Mondays, look at the entire week, especially that Monday. Each day, take a few moments early to get the day mapped out. At the beginning of each month, look at your big picture calendar stuff. The key is to keep looking at the calendar. Keep it familiar and up to date. Sometimes you need to change stuff. Schedule time for communication. Don’t read every email when it comes in. Did you ever have a boss who read each email as it arrived when you were trying to discuss something? Do you have employees or direct reports who are constantly checking messages when you’re meeting with them? Do you work on projects yet stop to read each email that comes in? Distracting is probably the nicest thing I can say about this kind of behavior. When smartphones were new, we all did this. But that was 2004. When email was new to us, we all did this at our desks. But that was 1994. I’m not saying you have to be militant here, but I am saying scheduling a few blocks of time to get things done will result in getting them done. If you look at my own calendar you’ll see blocks of time for email, phone calls, meetings, and other stuff. Be consistent with commitment. Don’t punt the calendar; stay with it. Follow the plans you made when you were making strategic decisions. If you’re in over your head, don’t get in the habit of constantly pushing stuff back and blowing off meetings. Weather the storm, and plan wiser for the next time. Be consistent with your own plans. Circumstances will force changes, but your calendar can also force circumstances. Go with it. Let your faithfulness to your calendar force you to be better. You’ll start learning about yourself and how you operate. Schedule appointments that include more than a meeting. Being early is hopefully very important to you by now. Schedule that. Build it into the block of time you have. Also include whatever you need to do related to the meeting yet happening directly AFTER the meeting. It is YOUR calendar. YOUR schedule. Put what you need on there. Prioritize The Right Things. You can say no. Almost always. Schedule the most important things first and then create space for the rest. What these “right” things are will depend on your situation. But get these on the calendar first. Someone else will get their most important things on your calendar if you don’t. Lock Down the best things first. This isn’t redundant, this is more about life. Put your family first. If your schedule keeps shoving your family off into a corner, then your schedule stinks. If your schedule doesn’t seem to allow your family to have a full experience with you as a spouse/parent, then your schedule has to go. Lose that lifestyle, not the family. If your paycheck requires you to deny access to your family on a regular basis, it is probably time to consider a new paycheck. There are busy seasons for all of us, and then there are unhealthy work environments. Our great grandparents didn’t have the options we have. They worked hard so we’d have these options one day. A smaller paycheck is a great investment at times for a healthy family. Obviously there are exceptions. Members of the military have made a huge sacrifice as have their families. This blog isn’t totally compatible with a military life. Pro Athletes and elected officials have rough schedules and time commitments as well. Being a pastor however is not the same as these. Prioritizing family is part of the job description. A pastor cannot serve effectively in ministry while abandoning their family for “ministry.” And being out of the home consistently several nights a week is just irresponsible for a pastor. You don’t want your pastor to do this. There are seasons in life, and some are busier than others. But family is the best thing. It is better than a career. If you are going to lose something: don’t lose the family; lose the career. Lock down the best things first.